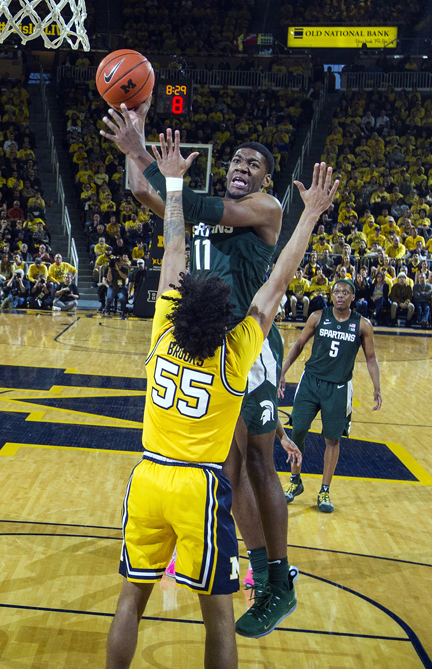 ANN ARBOR — Underestimate Tom Izzo and Michigan State at your peril. The Spartans are plenty dangerous — even when short-handed and playing on the road against a highly ranked rival. Cassius Winston had 27 points and eight assists, and 10th-ranked MSU now sits alone in first place in the Big Ten with a 77-70 victory over No. 7 Michigan on Sunday. Kenny Goins had 16 points and 11 rebounds, and Xavier Tillman added 14 points for the Spartans, who snapped Michigan’s 22-game winning streak at home despite being without two top scorers. Joshua Langford is out for the season, and Nick Ward is recovering from a broken hand, but Goins and Tillman produced in Ward’s absence. Michigan (24-4, 13-4) led by six early in the second half, but that advantage was short lived. Down 51-45, the Spartans (23-5, 14-3) outscored Michigan 21-7 to take control. The Wolverines shot 2 for 14 from 3-point range in the second half. Michigan had won three straight in this series, including two last year when Zavier Simpson more than held his own against Winston in the matchup of point guards. Winston was terrific Sunday, though, keeping his team afloat early in the second half and leading the offense against one of the best defensive teams in the country.